employment, professional credentials, and military records. Client is using NationBuilder site http://www.candidateverification.org/ to get the candidate to be register. But actually they are not utilizing the actual features of the NationBuilder. 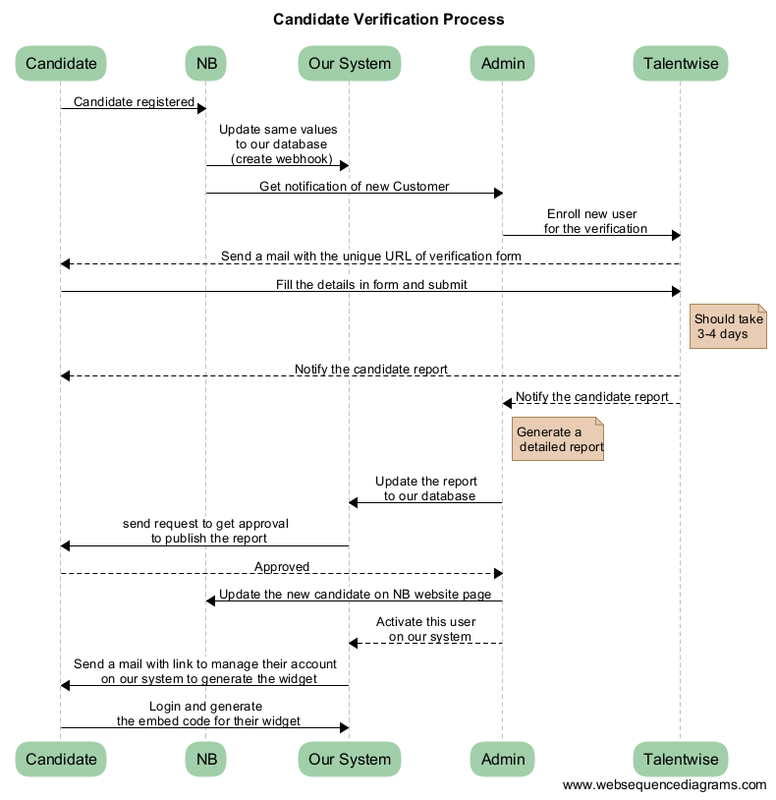 Also the verification process is totally manually as of now. Which needs involvement of admin (Our client) at every stage. Candidate registered from website, the admin will get email of new registration, and he will insert this details to their verification partner ‘TalentWise’ manually. This will send will email to the candidate to fill up the details requested by ‘TalentWise’ for their verification process. TalentWise will continue with their verification procedure and once done they will send email to our client that the specific candidate’s verification is done and client can download his report from the email. So our client will download the report and he will upload this report to scribd.com. Client is paying the money to this company too. Also he will place this new candidate to the live site manually and give the link to scribd.com to check that report. Also if any candidate want to show their verification to their website or anywhere else, than they have to create this manually as image. So how one can trust with such created image? So this is also the issue with existing process. So with above mentioned process, client is losing money as well as every phase needs his involvement. To accomplish with above objective, we should create an optimized process and make few operations automated to decrease the involvement of admin throughout the process. The current system don’t capturing any information about any user which we can use to generate dynamic widget. So first we have added one web interface here which must be passed for few processes. We should have our own database of all the registered candidate and their status and verification report. Right now all these process are held at third party screening partner. That is fine, but we also have to store these stuffs to our database. For which we have created an activity use-case in our scope of work section. Candidate >> NB // Candidate registered through the NationBuilder form. Here in the registration form there are two types, if there is already NationBuilder customers than we have provided slug verification to verify their ownership of any nation. For the normal users they will have normal sign up form. NB >> Our System // Once the candidate sign up from the NationBuilder form, than we will update the same values to our own server database using web-hook of NB. NB >> Admin // Admin will get the notification of new Customer. This email will have all the required details to know for the Admin to supply to the TalentWise. Admin >> TalentWise // Admin will simply register a new user at TalentWise with the details he got in email. TalentWise >>Candidate // TalentWise will generate a new unique URL to send the user to sign up. Candidate >> TalentWise // Candidate will fill the details in form and submit, TalentWise should take 3-4 days for the verification process. TalentWise >> Candidate // TalentWise will notify the candidate that the verification report is ready. TalentWise >> Admin // TalentWise will also Notify the admin that the candidate verification report for specific user is ready. Admin will extract the specific details needed from that report. Admin >> Our System // Admin will Update the report to our database so that we can track the details to be used for the widget. Our System >> Candidate // after adding the report to our system, Admin will have option to request an approval from the candidate to publish it on the website. This will send email to candidate with the activation link. Candidate >> Admin // Candidate will receive the email with the link, on click of this link admin will get notification of approval. Admin >> NB // after getting approval from candidate, the new candidates record will be display on the NationBuilder website. Once user will get login to the system, they will have a basic form with the details to be shows on his widget. Below are the list of items which he can manage from this area. NOTE // Here user can’t change their image, we will use the same image which he has submitted during his verification process. This is because a standard verified image should gain more trusting score. Select the list of checks user want to show in his widget – Multi select drop down with a list of all the checks. After submitting the form with above details, in the next page the candidate will receive a embed code, which he can use to place at his website, blogs or at any web page. Also he will get the dynamic generated image of the widget, which he can place anywhere and can share too. Here you can have a look at one example of the widget, this is just the representation of the widget, and we can make it look better.